Toronto Housing Affordability: What does it mean to Real Estate Investors? Toronto Housing Affordability: What does it mean to the Real Estate Investors? 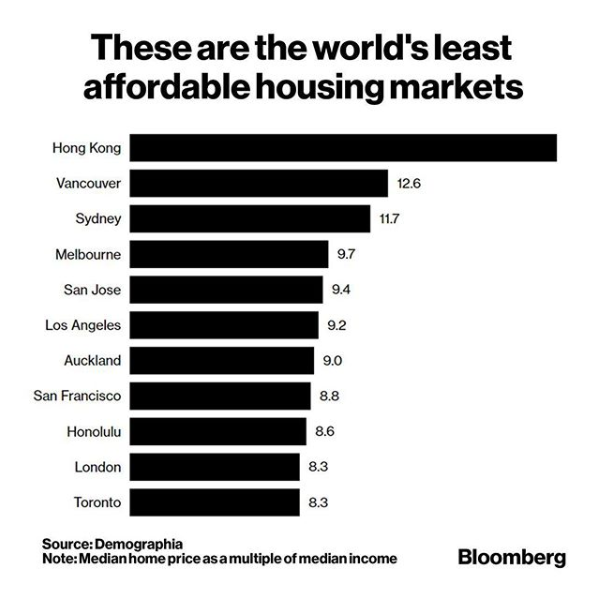 According to Bloomberg (original source: Demographia) Toronto is creeping up there in terms of housing affordability. While we’re not anywhere near Hong Kong or Vancouver at the moment we are actually on par with London. What does this mean for the real-estate investment market? Well, you can go in several directions here.First, the market may appear over-priced leading some investors to believe investing in GTA real estate is past its expiry date as the assets are over-priced, i.e. a bubble about to burst. Second, some investors believe that the trend will continue to tick upward as land becomes more scarce. They see an opportunity for long-term capital appreciation and a growing rental market. Everyone’s got to live somewhere and if they can’t afford to buy then they need to rent. Third, other investors will look to the outskirts of the core to areas for potential growth (think Hamilton, Guelph, Barrie etc.) hoping to capitalize on urban sprawl or predict how the city will mature. At Campanella McDonald LLP we help small business owners, self-employed professionals, and real estate investors maximize their bottom lines by providing value-added tax, accounting and financial advice. Our partners and staff have been advising clients on real estate investment matters since 2002. In addition to tax advice the firm has a dedicated team including investment focused realtors, mortgage brokers and financial planners that help clients design, implement and monitor their real estate investment portfolios from novice to seasoned experience levels. For more information you can email us at info@cmllp.com, or call 647-557-2935 ext: 101.